This easy skillet chicken and bacon recipe takes just minutes to prepare and cook, and the bacon gives it plenty of great smoky flavor. 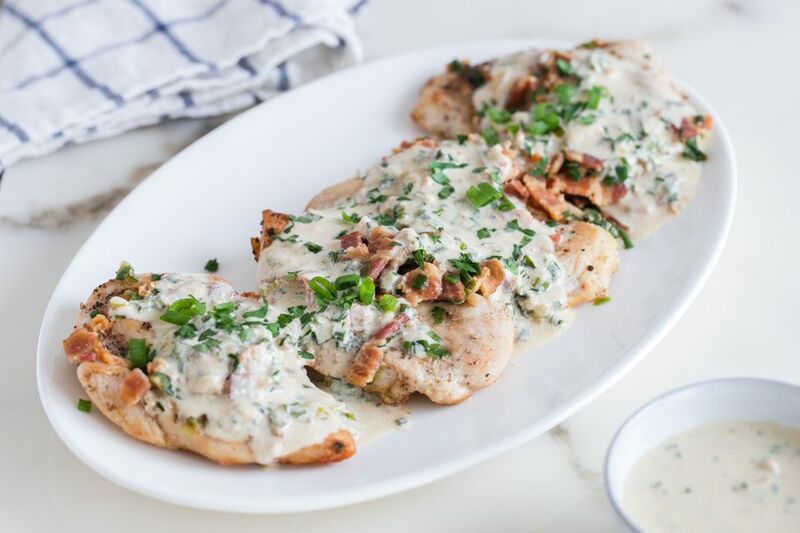 The tasty sour cream sauce finishes this quick and easy chicken dish perfectly. Serve the chicken with hot cooked rice or noodles and broccoli salad or your favorite side vegetables for a tasty everyday meal. Cook the bacon in the oven. Once done, drain on paper towel and then dice, reserving the bacon drippings for later. Wash the chicken and pat dry with a paper towel. Pound between sheets of plastic wrap until thinned and even in thickness. We like them about 1/2-inch thick, as it helps the chicken to cook more evenly and faster, too. Sprinkle the chicken with salt and pepper and dust lightly with flour. Put a few teaspoons of the bacon drippings and 1 tablespoon of butter in a large skillet or sauté pan over medium heat. When the butter is foamy, add the chicken breasts. Cook the chicken for about 4 minutes on each side, until nicely browned. Remove the chicken to a plate and add the green onions and garlic to the skillet. Cook, stirring, for about 1 minute, until onion is softened. Remove the onion mixture to a bowl and set aside. Return the chicken to the skillet and add chicken broth. Bring to a boil. Reduce heat, cover, and simmer for about 5 minutes. Remove the cover, add the onion mixture and diced bacon and continue cooking for 1 to 2 minutes, until hot. With a slotted spoon, remove the chicken and bacon mixture to a serving dish. Stir the sour cream into the remaining liquid, cooking and stirring just until hot and well blended. Do not boil. Pour the sour cream mixture over the chicken and bacon. Before serving, garnish the chicken with fresh chopped parsley. Serve hot and enjoy! Serve the chicken and sour cream sauce with hot cooked rice, buttered noodles, or boiled or baked potatoes along with your favorite side vegetables or tossed salad.